Next time you see big, beautiful, green heads of cabbage in the market, grab one up and make this delicious Classic Cabbage Rolls Recipe! 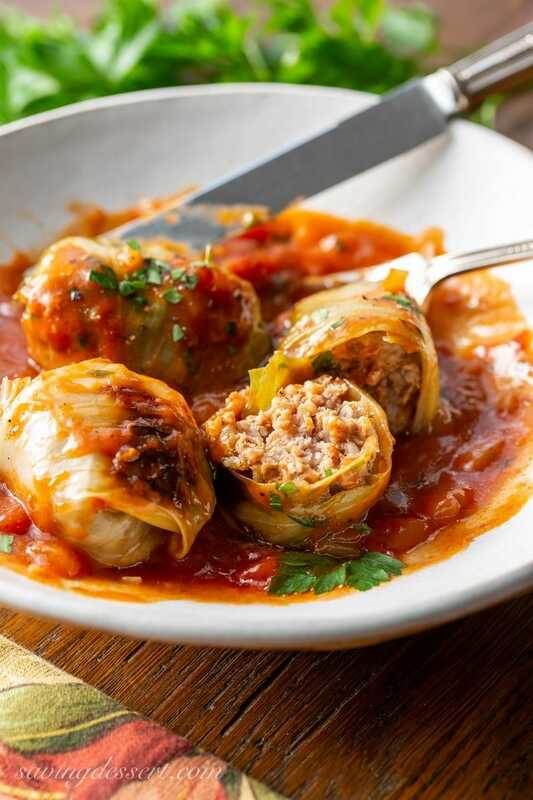 Who can resist a pan full of tender cabbage leaves stuffed with rice, seasoned ground beef and caramelized onions simmered in a rich tomato sauce! This is a filling and delicious dish sure to please your hungry family. Once assembled, you can cover and refrigerate until ready to bake. That makes this a great recipe for company too! No need to be in the kitchen up to the last minute. 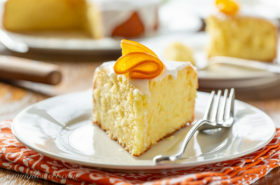 I love these kinds of recipes, easy to make, delicious and good enough for entertaining. This Cabbage Rolls Recipe makes enough to have leftovers for a few lunches, or another dinner the next day. Cabbage rolls keep well, reheat beautifully, and the flavor just keeps getting better. While growing up I remember my Aunt Libby always made cabbage rolls when we came for a visit; it was her go-to signature dish. All the ladies helped in the kitchen rolling up cabbage rolls in assembly line fashion, making more than enough to feed our hungry crowd. They perfected the tuck, fold and roll maneuver and in no time we were all stuffing our faces with her perfect little cabbage rolls. This was a favorite of my dad’s and he always asked Aunt Libby if she would make them for him again. The filling comes together quickly and easily, similar to an easy meatloaf. The sauce is super easy to make too. The cabbage leaves are the only thing that need a little finessing to make it easy to roll up the beef filling. Here are a few tips that will help make this recipe a breeze! Buy the biggest head of cabbage you can find. Look for a cabbage that is a little loose, with leaves that are easy to peel off. Select a cabbage with plenty of dark green leaves on the outer layers. These large green leaves make the best rolls. If you can only find small tight cabbages, pick up two so you have enough of the bigger outer leaves to use for rolling up the filling. If you find yourself with a lot of inner, lighter colored, small leaves, they will work just fine but they need to be cooked a little longer to make them pliable and soft enough for rolling. Don’t worry if each cabbage leaf is not the same size. Adjust the amount of filling so you are able to roll it up easily. Use toothpicks to secure the cabbage if needed on the smaller rolls. There are two different methods I recommend for preparing (precooking) the cabbage leaves. Core the cabbage and carefully peel off the leaves taking care not to tear them. For this first method you can boil the leaves for a few minutes in a stockpot of salted water. If you have a hard time removing the tight leaves from the head of cabbage, place the whole cored head in a large mixing bowl covered with plastic wrap. Microwave for 3 minutes on high until the outer leaves of cabbage are pliable and translucent. Carefully remove the wilted, outer leaves with tongs and repeat the process until you have enough for the recipe. Whichever method you use, make sure you can bend, and roll the leaves easily to form the rolls. Cabbage Rolls Recipes can be found all over the world. They’re very popular in Europe as well as China and Iran. 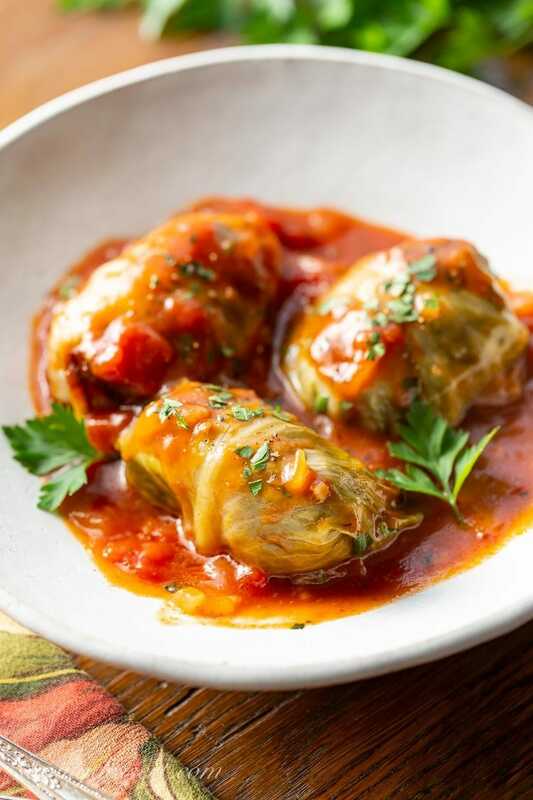 Cabbage rolls can be made with beef, pork or lamb, and are sometimes seasoned with ginger, cinnamon and nutmeg. My Aunt Libby was of Lebanese descent where the beef and rice mixture is most popular. In our recipe the rich tomato sauce is a little sweet and sour, for a lovely complex flavor and mild bite. I know you’re going to love it too! Let’s be cooking friends! When you try our recipe please feel free to leave a comment on this post. I’m sure your experience and insights will help all our readers, and me too. Also, if you’re on Pinterest feel free to leave a comment and photo there if you have one! If you share on INSTAGRAM tag @savingroomfordessert so we can stop by and give your post some love. And we’d be very happy if you’d FOLLOW Saving Room for Dessert on FACEBOOK| INSTAGRAM| PINTEREST | TWITTER and subscribe to our YOUTUBE channel for all the latest recipes, videos and updates. Thank you!!! Heat oil in a large ovenproof skillet (or Dutch oven) over medium-high heat until shimmering. Add the onion and cook until starting to caramelize, about 5 minutes. Add the garlic and crushed red pepper flakes and sauté for 30-seconds. Remove the skillet from the heat. Transfer half the onion to a large mixing bowl. Off heat, add the ground beef, cooked rice, salt, pepper, egg and milk to the remaining onion mixture in the skillet. Stir with a wooden spoon to combine. Divide the ground beef and rice mixture evenly between the 16 cabbage leaves. Overlap the cut ends of the cabbage to prevent the filling from spilling out. Place the filling over the area that overlaps and fold in the sides. Roll the leaf tightly around the filling to create a tidy roll. Place the cabbage roll, seam side down, in the now empty skillet, Dutch oven or baking dish. Repeat until all filling is used. In the mixing bowl with the remaining onions, add the tomato sauce, diced tomatoes, brown sugar, vinegar and water. Pour over the cabbage rolls. Cover the skillet with a lid or foil and bake until the sauce is bubbling and the rolls are heated through, about 45 minutes. Remove the lid and spoon some of the sauce over the cabbage rolls. Continue to bake, uncovered, for an additional 15 minutes. Carefully remove the cabbage rolls to a serving plate. Put the skillet with the sauce on the stove top and heat on medium. Whisk together the cornstarch and water and slowly add to the sauce in the skillet. Heat until thickened. 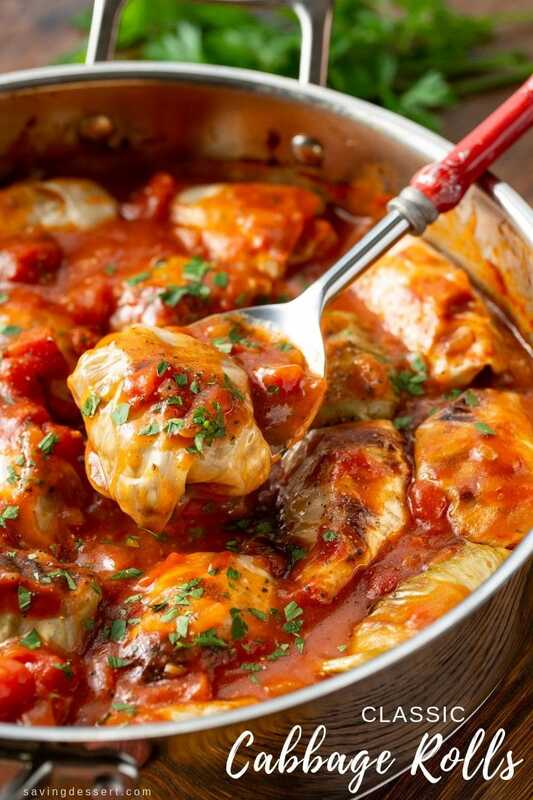 Pour the tomato sauce over the cabbage rolls and serve immediately garnished with parsley. There are two different methods I can recommend for preparing (precooking) the cabbage leaves. Core the cabbage and carefully peel off the leaves taking care not to tear them. For this first method you can boil the leaves for a few minutes in a stockpot of salted water. If you have a hard time removing the tight leaves from the head of cabbage, place the whole cored head in a large mixing bowl covered with plastic wrap. Microwave for 3 minutes on high until the outer leaves of cabbage are pliable and translucent. Carefully remove the wilted, outer leaves with tongs and repeat the process until you have enough for the recipe. You can do one method or the other, or a combination of both. Whichever method you use, make sure you can bend and roll the leaves easily to form the rolls. 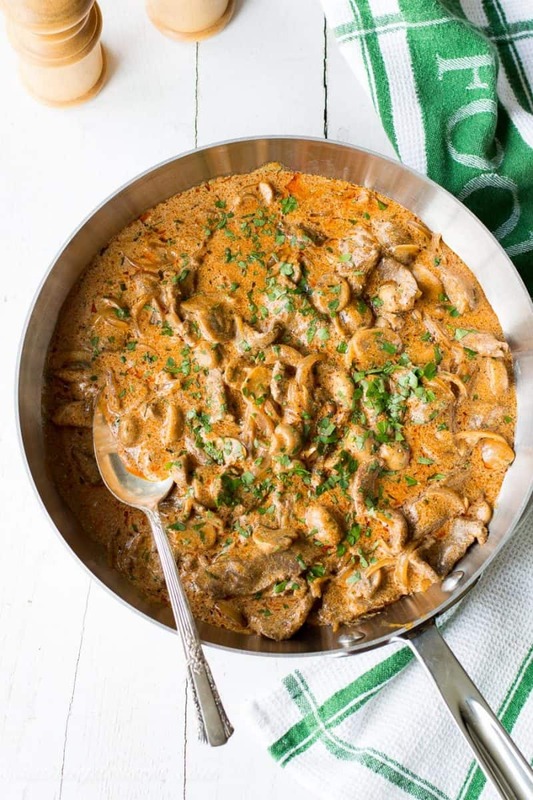 Try our easy Beef Stroganoff Recipe made with tender, quick-cooked strips of beef, sliced shallots, mushrooms and paprika simmered in a flavorful sauce of beef broth, dry white wine and sour cream. 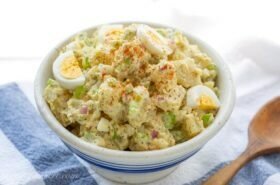 Serve over egg noodles, mashed potatoes or rice for an easy company-worthy dish that comes together in under an hour. Click HERE to get the recipe for Beef Stroganoff. 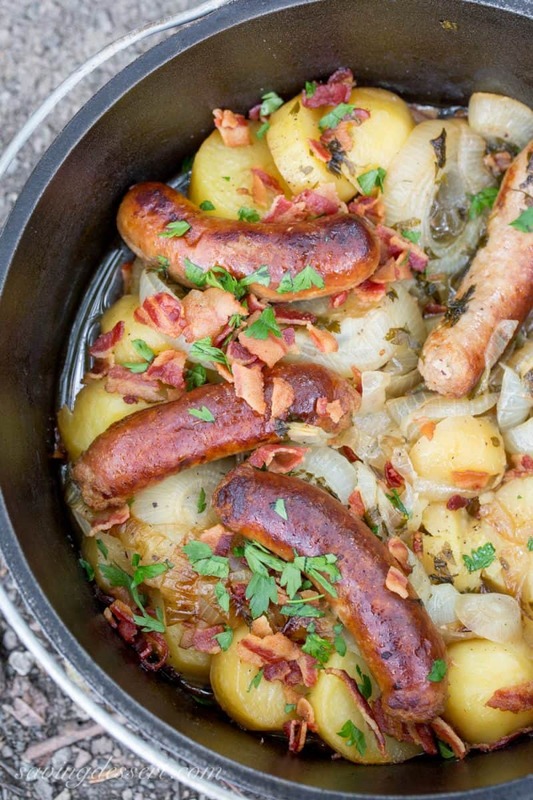 The Dublin Coddle is a delicious savory Irish classic made with potatoes, onions, rashers (bacon) and bangers (sausages) with a little chicken broth and beer thrown in. This would also be great with cabbage too. Click HERE to get the recipe for Dublin Coddle. 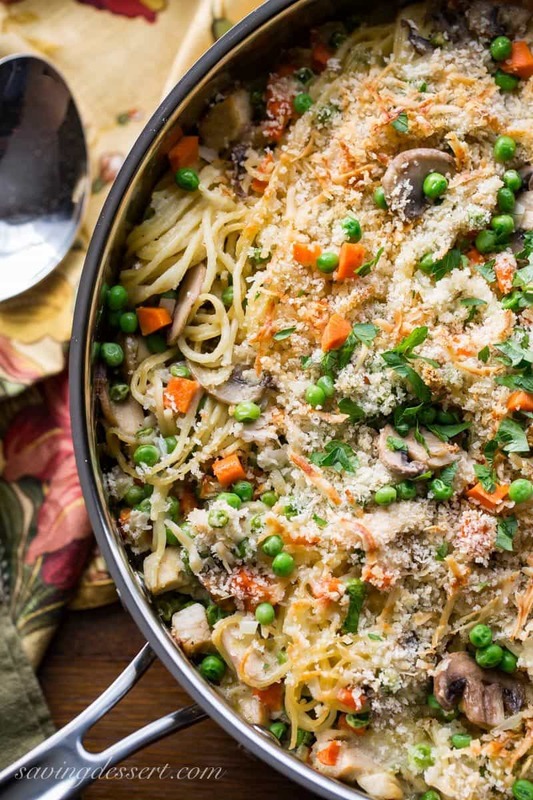 Turkey Tetrazzini Recipe – put your leftover turkey to work in this creamy, hearty casserole loaded with peas, carrots, Parmesan cheese and plenty of mushrooms. Click HERE to get the recipe for Turkey Tetrazzini. Haha – my husband found this at the farmer’s market – what would you make with all this cabbage? Cabbage rolls of course! A well equipped kitchen needs a good all-purpose stainless sauté pan that easily goes from stove-top to oven. This affordable 5 1/2 quart Cuisinart Chef’s Classic comes with a lid and helper handle for easy removal from the oven. Click on the photo for more information about our favorite large stainless skillet. Tricia, thanks! I made this yesterday and it was a HUGE hit! My hubby said it was as good as anything you can get from an restaurant. Delicious! 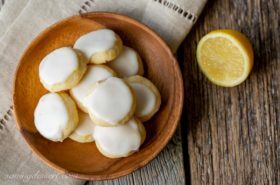 Hi Stephanie – the printable recipe is just above the area where you left the comment. It’s shaded in beige and is usually the very last thing in the post. Let me know if you still can’t find it. 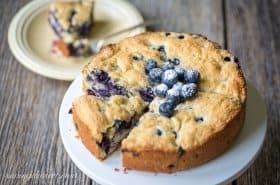 Such a good recipe! So for the cabbage rolls, do you put the red pepper flakes in the meat or the sauce? I haven’t made cabbage rolls in years, and I love them! Your photos are stellar, and make me long for a bowl of this– as soon as our Indian summer is over. That photo of your husband that the humongous cabbage is hilarious! Thank you so much! Cabbage rolls are a favorite of ours too. This looks like a perfect fall comfort dinner and I’m going to our farmers’ market this week! 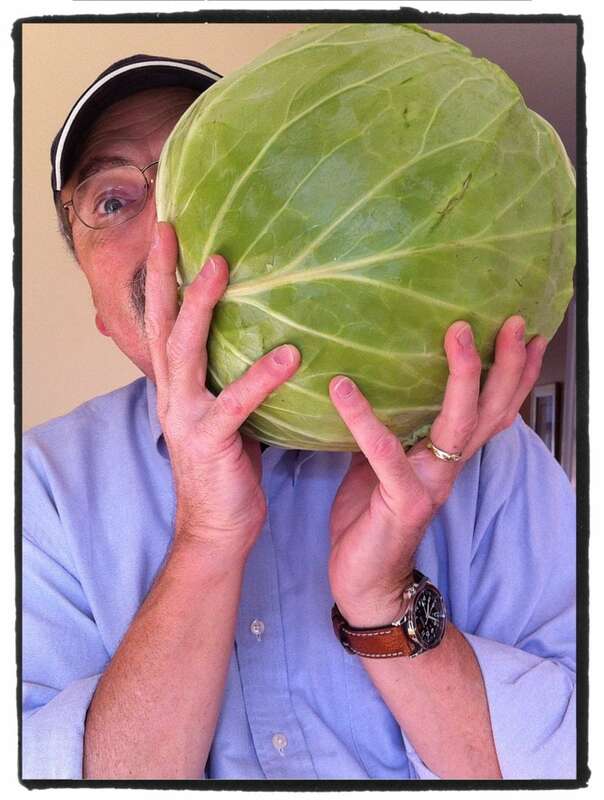 Oh my goodness that’s a big head of cabbage that your husband is holding! We love cabbage rolls but don’t make them often enough. Thanks! These rolls look SO yummy! They kind of look like raviolis with all that red sauce around. This is a beautiful thing! I love cabbage rolls. A while back for the blog I made a de-constructed cabbage roll dish, just because it seems that I always need about 3 heads of cabbage to get the best leaves. This way I just layered it with the goodies, although I used a white sauce instead of red. The the cabbage rolls are the prettiest presentation! Thanks Mimi. I love this idea of making a deconstructed version of this dish – must be so much easier! Love cabbage rolls, my grandmother used to make them for me anytime I asked her. They are a labor of love that I now realize when I make them myself. Your version sounds good. Thanks Karen – there are a few moving parts but they come together easily. Hope you try them – this sauce is fantastic. Cabbage rolls used to be a real treat when I was growing up in Germany. Now you buy them already made in cans, can you believe that? Your version looks super delicious. Canned cabbage rolls – sounds like something my husband would try 😉 Cabbage rolls have been around forever and for good reason. Thanks Gerlinde! This is my all time favorite, and I didn’t grow up with it, but later in life came to love this meal. Gorgeous photos! Thanks Sue – bet you’ll love this recipe – the sauce is so good! 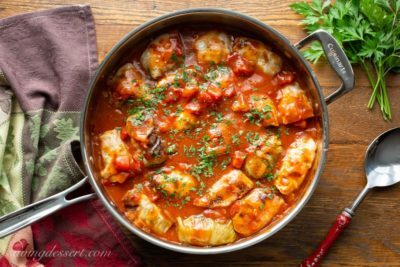 I really enjoy cabbage rolls, especially when someone else makes them – your look delicious as do the other dishes in this post. I don’t make them often enough either Jennifer – thanks so much! My mom never made cabbage rolls but I remember discovering them at a friends house as a child. I thought it was the best thing ever! These look amazing Tricia and I have been eyeing up all the beautiful cabbage at the markets! Thanks Chris! My mom didn’t make as much sauce as I do. I love the flavors and hope you’ll give it a try sometime! These look so good. I used make a vegetarian version years ago but I have never had them with meat! I would love to try this recipe. What did you use for the vegetarian version? Rice and vegetables would be good too – thanks for the inspiration! 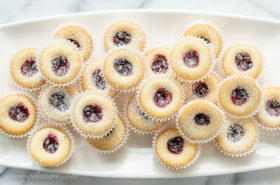 These look so good and I have them bookmarked to make this Friday night (wild, I know). Im going to try subbing cauliflower for the rice – cant wait and will let you know how it goes! ps – HOPING to have the blog up and running within 2 weeks.. waiting on internet peeps is a defo exercise in patience..
That was huge! Any leftovers for me? That is a huge cabbage! I've never made cabbage rolls, but these look great and don't sound that difficult to put together. The photos are gorgeous, and I'm pretty sure that stuffed cabbage is not the easiest thing in the world to make look so glamorous! I really want to make these, I've been seeing huge cabbages at the market myself. While I was in Wisconsin my daughter's boyfriend cut up a big head of red cabbage and is brining his own sauerkraut, it looks great! I love that picture of your husband, so funny! I haven't had cabbage rolls for a very long time also but from the looks of yours, Tricia, it might be time to re-visit! You make everything look good! Now that's a head of cabbage. Your cabbage rolls look delicious and I really like your presentation. How sweet of your husband! 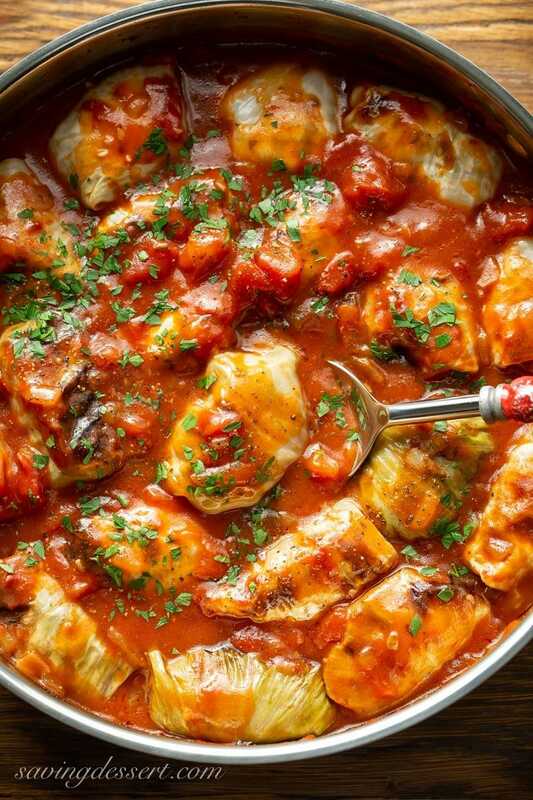 <br />These cabbage rolls look divine, Tricia.